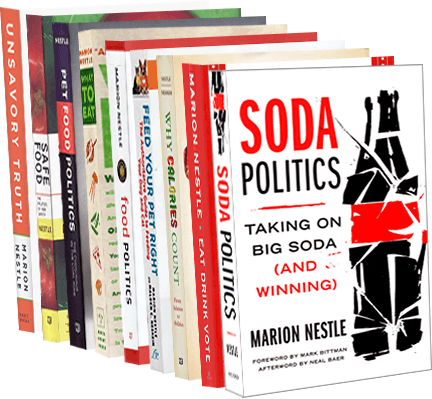 Food Politics by Marion Nestle » Happy Food Day! Center for Science in the Public Interest (CSPI) launched Food Day yesterday with a splendid lunch right in the middle of Times Square. I got to be one of the lucky eaters. Expand access to food and alleviate hunger. Curb junk-food marketing to kids. For half an hour, it got big-time billboard coverage. The lunch was nutritionally correct and quite delicious, thanks to Ellie Krieger who did the menus and is posed here with Mario Batali. Tom Farley, director of New York City’s Health Department, gave the opening speech with updates on his department’s new “cut down on sodas” campaign. For example: One soda a day translates to 50 pounds of sugar a year, and you have to walk three miles to burn off the calories in one 20-ounce soda! He’s here with Michael Jacobson who has directed CSPI since the early 1970s. It was all anyone needed to be inspired to join the food movement and sign up for the food day campaign! Later addition: Mike Jacobson sent this one with Morgan Spurlock.